The eight-year jail sentence of a Chinese-born American geologist has been upheld by a Chinese court. 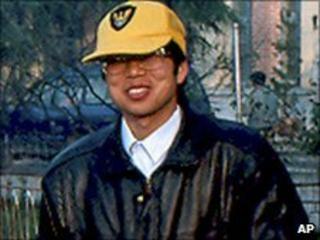 US Ambassador Jon Huntsman urged China to "immediately" release Xue Feng, following a hearing in which Mr Xue appealed against the conviction. He was convicted last July, after a two-and-a-half year trial, on charges of stealing state secrets. His case is one of many in which ethnic Chinese with foreign passports have been jailed on similar charges. The BBC's correspondent in Beijing, Martin Patience, says this case has come to symbolise the country's use of state secret laws to protect powerful business interests. Xue Feng, 44, was detained in 2007 after negotiating the sale of an oil industry database to his employers, an American consultancy company. Mr Xue said the information he had acquired about China's oil industry was publicly available. He claimed he had been tortured while in detention. Other cases include that of the Rio Tinto executive Stern Hu, now imprisoned in Shanghai, and several Hong Kong residents detained in business disputes. Our correspondent says the judiciary in China is not independent, and high-profile trials are often susceptible to government influence. The Beijing High People's Court proceedings were brief and a statement was read out denying the appeal for a sentence reduction for Mr Xue. "They rejected all our arguments," his lawyer, Tong Wei, said outside the courthouse. The jail term handed down was described by his lawyer as "very heavy". Mr Xue was also fined 200,000 yuan (£19,500; $30,000). "I'm extremely disappointed in the outcome, although it wasn't completely unexpected," Mr Huntsman said. "We ask the Chinese government to consider an immediate humanitarian release of Xue Feng, thereby allowing him to get back to his family and to his way of life," Huntsman told reporters outside the court. "This case has been brought up in every single meeting that I've been involved with for almost two years. "We'll not let this one go," he added. Our correspondent says that Washington had hoped that Xue Feng would be freed last month, ahead of President Hu Jintao's visit to the US. Mr Xue had arranged the sale of an openly available database about China's largely state-controlled oil industry to his US consulting firm IHS Energy, now known as IHS inc. The geologist has claimed that interrogators burned his arms with cigarettes and hit him on the head with an ashtray. Three Chinese nationals were also sentenced for illegally providing intelligence abroad. Draft regulations released by China's government last year defined business information held by state firms as state secrets. Legal observers have also voiced concern that China's courts are ignoring legal procedures when dealing with sensitive cases. They say that in Xue Feng's case, the time it took to reach the verdict delivered last July breached China's own legal time limits.